What Shall We Call Them? Entrepreneurs Or Self-employed? Way back in the mid years of the first decade of the millennium, I had tried to think through this issue; the thought of millions of Nigerians who struggle daily in various spheres of the economy to eke a living. With no special skills except the ones garnered from the traditional apprenticeship system, a system made popular by the Igbos of Nigeria. Not sure I was making much progress so I made to continue my search – so decided to talk to people who should know better than I do. A number of personas crossed my mind – a guru somewhere or …? Should it be a well-known entrepreneur or a priest, perhaps? But I settled for a professor. What Professor, you may ask? Aren’t they some recognized curators of knowledge? So I thought, acknowledging that professors are not necessarily the only repositories of knowledge and wisdom. I just reasoned that some of us would prefer to talk to a professor of business planning and strategy on a matter like this – especially one who started as a self-employed person,(he pioneered a processed food and confectioneries business), worked in a corporate years after where he rose to senior management in an investment banking institution before returning to academics in his later years. Others may prefer some other authorities. Whoever! Not sure we will ever get consensus. So, how do the core Nigerian commodity traders and other self-employed in their mould – not so literate, not so educated in formal business schools, forecast business environment, survive and earn their living? How do they interpret economic trends, beat adverse government policies? I got talking with Professor Ike Ali. “You can build some intelligence over time from experience and observation and be able to forecast to a measure. Every human being has predictive ability, how accurate or scientific that may be is another matter; formal education is an enhancement and to a large extent amplifies ability as it helps to draw out or direct attention to what already exist. Yes, it helps you to master and manage your abilities and environment. Without formal education, the basest of human mind finds other ways to deal with these issues and so the not–so educated as you put it, know something another way,” Professor Ali explained. “They may have their limitations especially now that we live in technology-driven world, but they know something; they may lack ability to articulate but their limitations force ‘strong memory and instinct on them,’ the Prof continued. Thank you Prof. Ali for the perspectives you have provided. I hope you wouldn’t mind if I stretch this a little more. Would you call these traders of all hues, artisans and some native brokers, entrepreneurs? If not, what are they? Prof, you know why I am asking this question – for years in Nigeria, one of the commonest discussions is entrepreneurship, self employment and sometimes, innovations. Often, when these discussions are held, all the attention seems to go to the formal entrepreneurs with what we call the “bankable business and written business plans” – ICT, other start-ups, registered businesses etc and then turn around to give hand outs to these less fancied self-employed in the name of micro-credit. Only recently have they begun to give some attention to this category of economic players I am referring to. “I get your drift”, Prof interjected; “these are peculiarities of our environment yet operating environment is man-made; nonetheless anybody or group of persons who pursue an idea to the point of developing it into a product or service or even to support the production of those, and are able to earn income from those in a sustainable manner, is in the class of entrepreneurs. They may not be as fanciful as the ones we read in popular business journals/publications or have gone through all the rigours of the poster entrepreneurs. In any case most great and popular entrepreneurs started crude to some extent. I think entrepreneurship is firstly in the mind, the quest and restlessness to find solutions to needs, the determination to continue to try until success comes; often they see what others can’t see. The ‘rebel’ mentality of wanting to do your own thing, self assurance and confidence etc are hallmarks of those who live as entrepreneurs. I must add that they are in categories, diverse persuasions and such like,” Prof explained. Prof, I trust you will be a little more patient with me in this conversation. Just now that I have you around, let me try and discuss some of my observations even if they sound a bit strange. Please permit me. I have had the fortune of travelling some parts of our country Nigeria. I have seen people earning a living on their own though physically-challenged. “How do you mean,” Prof interjected? The most important attributes of an entrepreneur is mental and attitudinal; not having two hands, legs or eyes are not enough to stop one from being one. So what is it about the physically-challenged entrepreneur?” As usual, your remarks sound insightful and comforting Prof.
As I was saying, few years ago I visited Akwa Ibom state, down south of Nigeria. I had something to do at Ibaka, the much touted host community of Nigeria’s deepest sea port but preferred to pass the night in Oron, a more urban area. After checking into a hotel, I realized I needed some toiletries and medication. After inquiries, I went out riding a commercial motorcyclist, Okada. I used two different cyclists until the third driven by one Okon, who knew the right pharmacy I should go to. Two or three times, we missed running into electric poles on the left including missing by hair’s-breath ending up in a big concrete drainage. My curiosity rose so sharply. I re-examined myself and Okon, the cyclist. Prof, you know what I found out, Okon, was blind in one eye – the left one. I was caught in between two opinions – to pay him off and alight or to continue to take the risk. I decided to co-drive the vehicle as I took pity on him and considered his courage for undertaking to help himself. I wondered why he chose to work in the night with his handicap and surmised that in the day time, passengers would avoid him. Prof, what do you make of this? Professor Ali, as I said earlier, my journey around our country has gifted me some knowledge of our realities – add to the story of the cyclist blind in one eye, I was “privileged” to be driven in the Lagos popular commuter bus, Danfo by a driver paralyzed in two legs. They know him as Gbenguze, corruption of Oluwagbenga. How about that, Prof? You may want to know? Hmmm, yes to the extent that all through the commute from Anthony bus stop to Mile 2, he drove on BRT lane in defiance of the rules and escaped contravention repeatedly on account of his handicap state. The ride was anything beyond bumpy and intermittently life jerking. He used the improvised brake system in near fatal manner, always screeching to stop at bus stops. It was the braking style that got me most suspicious. Somehow, I found that the Volkswagen bus was running on an improvised throttle, gear and brake system built to be manipulated by his two hands. The crudity of the system gave me the impression that it could have been done locally by not the not-so-skilled. But it was serving the purpose at least, Professor Ali. “Emeuwa, I have never doubted our people’s resilience, ability to design and fabricate but have been worried that we haven’t managed to up the game – refine, mass produce and automate where applicable. We must have more FIROs spearheading research and machine productions; our economic progress will not amount to much if we don’t radically industrialize, automate machineries and do volumes. Entrepreneurship is for economic progress and advancement and ultimately for the good of our country.” Prof, how much of this sermon is heard by those in position to make and execute relevant policies to cause economic prosperity to happen so quickly, I asked in response? Prof, please permit me like you would your colleague jocularly called Professor One-more-thing. 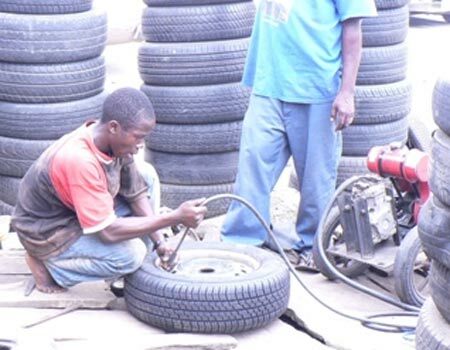 If you would Prof, just this one more story – of these never-say-die Nigerians, ingeniously earning a living. Mohammed is one of them. I met him at the Suleija park for Minna vehicles. There, Mohammed paralyzed on both legs and on wheel chair works as ocho passenger, agbero, passenger canvasser for Minna commercial transporters. He attracts attention with his enthusiasm, defiance to his physical challenge and willingness to assist inspite of his obvious challenge. Mohammed earns his income from tips provided by sympathetic and satisfied passengers and share of pooled commission earned at the make-shift park. Better than his colleagues, Mohammed speaks admissible good English which gives him advantage over most of his agbero colleagues who are more comfortable in Hausa language. Now, Prof, is Mohammed also an entrepreneur? Tagged as: What Shall We Call Them? Entrepreneurs Or Self-employed?